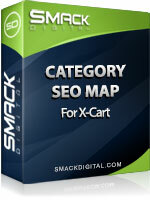 Category SEO Map for X-Cart Category SEO Map for X-Cart modifies x-cart's subcategory links to improve your x-cart SEO by modifying your internal link structure with subcategory pages linked from the parent category listing. With the Category SEO Map for x-cart installed, previously buried sub-category pages and products will be available to search engines and customers from the top-level pages, increasing the pages weight in search engine results while making it easier for customers to find exactly what they're looking for. Will display all subcategories for a category to infinite levels deep. Large stores can limit the number of subcategories displayed. Improved display available by optionally showing images for current subcategories (see detailed images). Displays the number of products within subcategories. Compatible with SEO urls such as CDSEO, DSEFU, XCSEO and the HTML Catalog.